Congressional Quarterly compiled a full transcript of President Trump's remarks at his Tampa rally on July 31, 2018. JAMES BORCHUCK | Times Donald Trump greet Ron DeSantis during a rally at the Florida State Fairgrounds in Tampa Tuesday, July 31, 2019. Congressional Quarterly compiled a full transcript of President Trump's remarks at his Tampa rally on July 31, 2018. U.S. Rep. Ron DeSantis' remarks are also included. President Donald Trump Delivers Remarks at Rally in Tampa, Fla.
Hello. Incredible people. I am thrilled to be in this great state where we, by the way, had a great victory. With thousands of hardworking American patriots who love our country and respect our great American flag. We're honored to be joined tonight by some tremendous people. Congressman Gus Bilirakis. Gus! Where is Gus? Where is Gus? Where is Gus? Ted Yoho and Matt Gaetz. Thank you. Great, fellows. Thank you. Thank you. Thank you, fellows. I also want to recognize State Representative Jose Oliva and the former co-chairman of my Florida campaign, Representative Joe Gruters. Joe? Thank you, Joe. Thank you. And finally — I love you, too. I'd like to introduce a true leader, a proud veteran, my great friend, a tough, brilliant cookie. True. 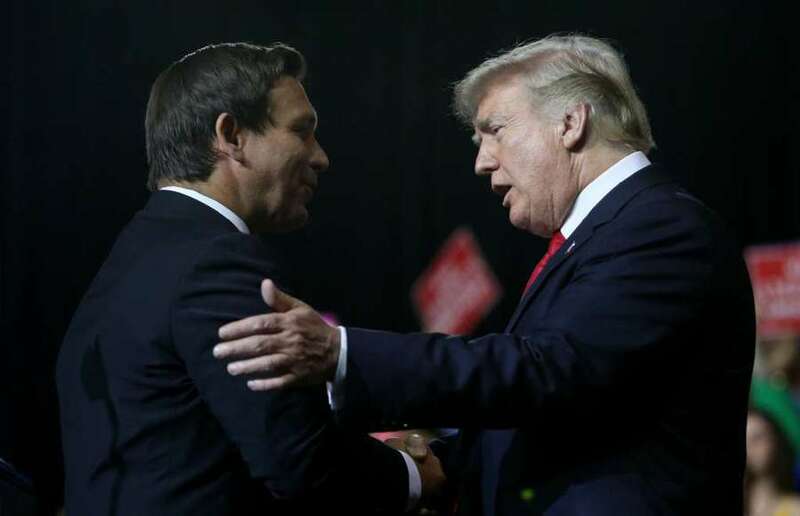 He's tough, he's smart, and he loves Florida, and he loves our country, and he's going to be your next governor, Ron DeSantis. Welcome to Florida, Mr. President. For someone who grew up just across the bay in Pinellas County, starting out working six bucks an hour, it's a true honor to be standing here, endorsed by the President of the United States. I appreciate your support, Mr. President, but I appreciate more the leadership you're showing for our great country. We have the strongest economy we've had in years. We are standing foursquare behind our ally, the State of Israel. We have strong Constitutionalists was being put on our courts, including the Supreme Court. We have ended the disastrous Iran deal. And under the president's leadership, we are standing against socialist dictatorships in Latin America like Cuba and Venezuela and Nicaragua. Florida is going in the right direction, and we need to continue our success and build upon it. We can't go back to the days of Charlie Crist, where the good ol' boys run the show. We can make our state without peer for economic opportunity if we continue with strong Conservative policies. We can fight illegal immigration. All we've got to do is enact E-Verify and stop sanctuary cities. We can end judicial activism in Florida by appointing solid Constitutionalists to our state courts, just like the president has done to the federal courts. … By giving every child, regardless of circumstance, the ability to attend a good school, and by getting the Constitution back in our classrooms in a very big way. So, Mr. President, thank you for your support, thank you for what you're doing for the state of Florida. I ask for your vote in the August primary, August 28th, I'd be honored to have it. Thank you guys and God bless America, thank you. Thank you. Thank you, Ron. And everybody needs to support Ron DeSantis in our August 28th primary and in the November general election, don't forget. You have somebody, one of the group is going to be running on open borders, anti-ICE, anti-law enforcement. Oh, that's too bad, that's too bad. That's too bad. That's too bad. One person – one person, and tomorrow the headlines will be massive protests. Too bad. Sorry about that, Ron. Earlier today I also spent time with your current Governor, one of our nation's truly great leaders, Rick Scott. … And the new star of the Democrat Party, Maxine Waters. Name is Bill Nelson, and you know I live a lot of time in Florida. The only time I see Bill Nelson is five months before every election. And after a while you forget, who's the Senator? But around five months you see him at parties and you see him around and we have to be careful, because we have to make sure that Rick Scott wins and wins big. Bill Nelson voted for Obamacare, which has been a totally disastrous situation. And we got rid of the individual mandate, the most unpopular aspect and most of Obamacare will be gone very soon. … He opposed Kate's Law. Bill Nelson puts criminal aliens before American citizens, which is why it's time to vote Bill Nelson out of office. That's what's going to happen. And we have two unbelievable people — Ron DeSantis, Rick Scott — fighting for Florida. They always will. And fighting to make America great again. That's what they're doing. So — I'm sure we all say this about our children, but I have great children. And a couple of them-plus are here tonight. I have Eric Trump, who's been fantastic. He loves this political stuff. Eric's wife, Lara, who is so great. I think she singlehandedly won the state of North Carolina for Trump. Thank you, Lara. Didn't hurt in Pennsylvania, either. Thank you very much. And we have somebody that nobody ever heard of, Ivanka. Ivanka. Thank you. And, you know, we have a big thing happening because you know this — look at all those hats. White ones, red ones, they all have the same thing, "Make America Great." Well, make America great again. Only to be replaced by "Keep America Great" in about, I don't know, I guess we could do it now but let's wait another year. We could do it right now, frankly. We're doing fantastically well. I also want to thank David Bossie for being here, Corey Lewandowski for being here, two of our great supporters. I'll tell you, they are two fighters. We like fighters, don't we? We started off, it was a small group. They said it couldn't be done. It was actually done quite easily. We won quite handily. We were never left center stage. You know what that means, right? The debates. We never left center stage. And I said, "I always want odd numbers." Because I want to be in the center. I didn't want to be tied for the center. Does everybody understand? But we never — we never left center stage. And I'll tell you. Corey, David, Ivanka, Lara, Eric, Don, Jr., all of them, they were fantastic. They were fantastic. And I have to say, our First Lady is home watching. Look at all those cameras right there. She's home watching. And everybody loves Melania. They love Melania. Great. Doing a fantastic thing. She's doing a fantastic job. Just last week, it was announced that the U.S. economy grew at 4.1 percent last quarter. It was a number that everybody said was not reachable. And I would never want to say it during the campaign, even though I believed it. I believed it, because they would not have given us the break. Fake news, fake news. They are fake. No, I mean, do you believe — look at this: Every night, it's the same thing. Wouldn't you think they'd get tired of these speeches? Wouldn't you think? And here's one thing I'll tell you: If they don't get ratings, those speeches don't go on, doesn't matter. Look how many they have back there. They just can't get enough. They can't get enough. They cannot get enough. And by the way, outside, if you want to go, we set up, for the first time, a tremendous movie screen, because we have thousands and thousands of people outside that couldn't get in. So we have a big screen and big loudspeakers, and I hope you're all happy out there. This is a great place to be. If you've got to be outside, be outside in the great state of Florida, right? Right? So we're setting records like never before. Since the election, we have added 3.7 million new jobs. They would not have believed that. We're in the longest positive job growth streak in history. Think of that. Remember, I said, "What do you have to lose?," right? What do I — OK? What do you have to lose? And people said, "I don't know." Is that a nice thing? No, it's not nice, or not un-nice. What do you have to lose? The African-American unemployment rate has reached the lowest level in history — history. Thank you. You guys are great. Thank you. Blacks for Trump. They say, "Blacks for Trump." You knew a long time ago, didn't you, huh? You knew a long time ago. Thank you, folks. Thank you. The Hispanic unemployment rate is at the lowest level in history, Hispanic. The Asian unemployment rate has reached the lowest level in history. Sorry about this, women, but the employment rate has reached the lowest level in only 65 years. It'll be history soon. It'll be. It'll be history soon. Give us about two more weeks. The veterans' unemployment rate — oh, do we love our veterans, right? Has reached the lowest level in 18 years. More than 3.5 million Americans have been lifted off food stamps since the election. American oil production is at an all-time high, we have never produced as much. And the United States is now a net natural gas exporter for the first time in more than 60 years — 60. We will very shortly be the largest in the world in energy, the largest in the world, think of that. And most importantly, America is being respected again, we're respected again. And I told the story the other day, I get to meet all these world leaders. Virtually everyone comes into the Oval Office or wherever we're meeting and they don't know me. I'm meeting them in many cases for the first time. I'm not sure they like me, like in the case of NATO. I said you got to pay your bills, folks, got to pay up, got to pay up. But they liked it, they liked it. But everyone that reached me says hello, Mr. President, congratulations on what you've done for the economy. It's the talk of the world, talk of the world. Now that we have the best economy in the history of our country, this is the time to straighten out the worst trade deals ever made by any country on Earth, they are the worst. … The foe, foe. We rebuilt China paying hundreds of billions of dollars a year with nobody there to protect your money. But you're there now, we are protecting your money. And I want to thank our farmers, our farmers are true patriots. Because China and others have targeted – China and others, remember this, have targeted our farmers. Not good, not nice. And you know what our farmers are saying? It's OK, we can take it. These are incredible people, we can take it. You know why? They target our farmers because they know it's one of our great strengths. It's us, it's not me, it's us altogether. They know it's one of our great strengths. We won every farm state, you're going to see that middle of that map – wasn't even the middle, it was about everything but a little corners of each side. But you have to see, that is all red, Republican red, beautiful, Republican red. And remember this, remember this. Farms have been on a decline, I mean it's been for 15 years. I've only been here for, you know – it's pretty soon going to be close to two years. But if you look at soybeans – big crop. If you go back to Election Day and then move back five years, so five years before Election Day, soybeans dropped 50 percent in price. I wasn't even here, so now we're going to open up markets, We're going to do it the way it should be. And all of this stuff, you're going to make it back and it's going to be made back faster than anybody would know. But we haven't been treated right. We're going to make it back nice and quickly. Nice and quickly. Now, after years of rebuilding foreign countries, it's time to finally rebuild our country, right? Wouldn't you say? In the past, politicians ran for office pledging to crack down on unfair trade. They never did anything about it. Only to get elected, and they just didn't do anything. The United States was allowed to truly get ripped off. But we're not going to let that happen. I'm not like other politicians. You've seen what happens. I've kept my promises. One of the brilliant pundits that has a — doesn't have a clue. I mean, these people, how they have gotten us wrong. And you know what they were asking, Election Day, "Where did all these people come from? Where did they come from?" In Tennessee, that was an early state. They came in and they were pouring in with the early vote. And the fake news was saying, "Where are these people coming from?" You know where they came from? They came from the heart. They came from people that were never happy with anybody until we came along. That's where they came from. That's where they came from. But one of the pundits said that "He's made a lot of promises. And you won't believe it, but he's actually kept far more promises than he made." Did you ever hear that one? So. Of course they'll probably be throwing him out of broadcasting tomorrow. We've taken the toughest-ever actions in response to China's abusive trade practices. And we're doing very well with China, very well. And I have a lot of respect for China. And I have tremendous respect for President Xi of China. But this has been too many years of abuse, $500 billion a year. $500 billion. We've helped rebuild China. We can't do that anymore. We can't do that anymore. And our farmers understand it, and our workers understand it. And, frankly, our companies understand it. I was with one of the greatest companies in the world. The chief executive officer, very short while ago. And it really affects him. He said, "You know what, this does affect our company. But, Mr. President, keep going. You're doing the right thing." I thought it was great. A great company, one of the greatest. He said, "You're doing the right thing." And I said, "I appreciate it." Thanks to our powerful trade policies, the trade deficit is falling and falling and falling. And, boy, did it fall this quarter. The days of plundering American jobs and American wealth, those days are over, they're over. America first — America first. We're also living by two very important rules, buy American and hire American. Last week I visited with hundreds of American steel workers, who were laid off years ago because other countries were dumping steel all over our country. They're not dumping so much anymore, you notice? And if they do, they're paying a 25 percent tariff or tax. So you know what I say to that? Dump all you want. I hope you dump a lot. Now thanks to our tariffs, our steel workers are back on the job, American steel mills are back open for business, we are starting to set new records and nobody believed it could happen this quickly. U.S. Steel just announced that they're building six new steel mills. And that number's soon going to be lifted, but I'm not allowed to say that, so I won't. And I'm very proud to report that NuCor is going to build a brand new $240 million steel mill – that's a big one, right here in Florida, the head of NuCor is here. Thank you, thank you – head of NuCor. … They want to crush our industries with crippling regulations, and you know the stock market is up almost 40 percent since that great November day. Your 401Ks are doing very well, 401Ks. I tell the story, I was in New York and I shake hands. I love law enforcement – do we love law enforcement? And I was shaking hands with policemen in New York City, and the first one came up to me and said Mr. President, I want to thank you so much. I said what did I do? He said my 401K is up 44 percent and my wife thinks I'm, for the first time, a financial genius. She's giving him all the credit. She said – she said darling, I love you so much and he said yes, I'm a great financial wizard. But he said you're looking – you're just making me look so good, and all of you – who has 401Ks here? I guarantee you one thing, I have your vote. I guarantee it. Of course, if the fake news did a poll, they're called suppression polls. You know, polls are fake, just like everything else. If the fake news did a poll, it would show that I'm only getting 25 percent with the 401K people, even though they're up 44 percent. No, we got — we're doing well. We're doing well, and I'm happy you're doing well. They just came out with a poll — did you hear? The most popular person in the history of the Republican Party is Trump. Can you believe this? So I said, "Does that include honest Abe Lincoln?" You know, he was pretty good, right? Remember, I said, when I'd be a little bit wild, and we'd have a lot of fun, they'd say, "He's not acting presidential," and I'd say, "Well, it's a lot easier to act presidential than to do what I do." Anybody can act presidential. Ladies and gentlemen of the state of Florida, thank you very much for being here. You are tremendously people, and I will leave now, because I am boring you to death. Thank you. No, but I said, "I can be — " I used to tell them all the time, the fake news, I'd say, "I can be more presidential than any president in history, except for possibly Abe Lincoln with the big hat." I — I don't know about that. Abe — Abe looked pretty presidential, right? What do you think? He's tough. He's tough. I admit it: Abe Lincoln is tough. But we love Abe Lincoln. One of these guys, when that poll came out — most popular — and it was in the 90s. And one of these guys is on television. You know, can't miss a word. Can't miss a word. Every — they see the poll. "Oh, my God. Oh, my God. Look at this. Oh, my God." Yeah, seven more years, seven more. Seven more. "Oh, my God. We've got to find something. We've got to do anything — anything — to get him out. He's doing too well. This is not good." Worst of all, Democrats want to — you know that. They want to open our borders. They want to let crime, tremendous crime into our country. We can't do it. Republicans want strong borders and no crime; Democrats want open borders, which equals massive crime. And on top of that, the Democrats — Nancy Pelosi, the whole group, Maxine — Maxine. She likes me a lot. She likes me a lot. They've launched outrageous attacks on our incredible law enforcement officers, and on ICE and our Border Patrol, can you believe it? People that keep us safe. Their new platform, what they want to do – the Democrat Party, they want to abolish ICE. So in other words, they want to let MS-13 rule our country. That's not going to happen. Every day, the brave men and women of ICE are liberating communities and towns from savage gangs like MS-13 that are occupying our country like another nation would. We want maximum border security and respect for our heroes, ICE, Border Patrol and law enforcement. And we're going to have tremendous border security that will include the wall — that will include the wall. Now a lot of people don't know it but we've already started the wall. We got $1.6 billion and we've started large portions of the wall, but we're going to need – even the way we negotiate, we're going to need more and we're going to get more and we may have to do some pretty drastic things, but we're going to get it. Because the Democrats – the Democrats are not voting for what we want to do and they're not voting and allowing our values to take place in our country. We're tracking down the gang members and we're tracking down the drug dealers and the child predators and the criminal aliens and we're throwing them in jail or throwing them the hell out of our country. In some states, Democrats are even trying to give illegal immigrants the right to vote. They want to give them the right to vote. … Which is why the time has come for voter ID like everything else, voter ID. You know, if you go out and you want to buy groceries, you need a picture on a card, you need ID. You go out and you want to buy anything, you need ID and you need your picture. In this country, the only time you don't need it in many cases is when you want to vote for a president, when you want to vote for a senator, when you want to vote for a governor or a congressman, it's crazy, it's crazy. But we're turning it around. Remember I said it's awfully early to be thinking this, but I always think it, remember the attack on Merry Christmas, they're not attacking it anymore. Everyone is happy to say Merry Christmas, right? Merry Christmas, Merry Christmas, Merry Christmas. That was under siege. You have these big department stores they say, "Happy Holidays." I say, "Where is the Merry Christmas?" Now they're all putting up Merry Christmas again and that's because — only because of our campaign. And by the way, the evangelicals and Paula White, Pastor Paula White, the evangelicals have been so amazing to us. They came out and they voted 84 percent and doubled and tripled the numbers that ever voted in an election before. We love the evangelical Christians. If you want safety, if you want borders, if you want to have a country, then you need to go out and vote Republican. And very importantly, you need to go out and vote for Ron DeSantis for governor of Florida. The lobbyists and special interests fighting against my administration, many of them are globalist. They care what happens in other countries. I care what's happening in the USA. They're the geniuses who came up with our terrible trade deals one after another, how about NAFTA, remember when they signed NAFTA? Remember they signed NAFTA and everybody just moved their companies down to Mexico and these people were saying, "Isn't that a wonderful thing?" No, it's not a wonderful thing and those companies are now moving back. These are the people who lost trillions of dollars overseas and who gave us our horrible immigration laws. These laws are the worst. I am for America first and the American worker. We want to be a puppet for no one any longer. We're not going to be a puppet any longer. You know, I told the story the other day, I was probably in Washington in my entire life 17 times. True, 17 times. I don't think I ever stayed overnight. You know what I'm getting at, right? And we have a great cabinet now, a couple of little changes. But we have a great cabinet. We have — Mike Pompeo, our Secretary of State. So many great people. And we're really getting – we have just incredible people. But I made some choices that I wouldn't have made. But I'm riding down Pennsylvania Avenue. Again, I've only been here about 17 times. And probably seven of those times was to check out the hotel I'm building on Pennsylvania Avenue and then I hop on the plane and I go back. So I've been there 17 times, never stayed there at night. I don't believe. And then I'm riding down in this beautiful car, picked up at the airport by Secret Service, holding the hand of our great first lady. And I look at her and I say, "Honey, guess what, I'm president of the United States!" President of the United States. And I didn't know anybody in Washington, but now I know everybody in Washington. I know the good ones. I know the bad ones. I know the wonderful people and I know the scum. And America now is winning again like they haven't won before. We passed the biggest tax cuts and reform in American history, biggest cuts in history. 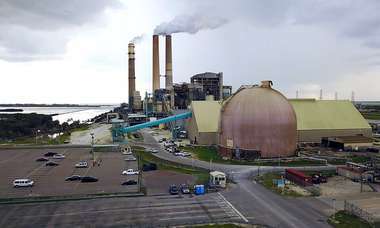 More than 100 utilities have slashed rates for consumers including right here from Duke Energy and Tampa Electric. Your rates have gone down. Over $300 billion poured back into the United States in the first quarter, and we expect to be taking back because of our new tax cut and reform plan that passed bigger than anything ever in our country. We expect to be taking back from overseas over $4 trillion. That's a lot of money — could never have come back before. And if our opponent had won and the Democrats had won, they would've put more regulations on. They would've raised your taxes. They would've opened your borders, gotten rid of law enforcement. They would not have helped your military. And you know what? Our country would be going to hell. And instead of going up, the market would be half of what it was if we're lucky, because frankly the tax cuts were incredible to what we've done. But maybe even more important are the cuts in these horrible regulations that didn't allow anybody to do anything, job-killing regulations. We've gotten rid of more regulations than any president in the history of the United States. And that's done in less than two years. I withdrew the United States from the unfair one-sided very, very expensive job-killing Paris Climate Accord. We repealed the core of Obamacare. The individual mandate is gone. You know, the individual mandate. That's a beauty. Only the past administration could have come up with this. That's where you pay a lot of money for the privilege of not paying in order to have poor health care. Other than that, it's a wonderful thing. So you pay all this money for the privilege of not having to pay and the health care is no good to start off with. And we're doing great on health care. We're allowing Americans to buy better health care for less money through association health plans, including across state lines, bidding, you're getting tremendous competition. We passed the biggest VA reform in half a century, Veteran's Choice. If our veterans can't get the care they need from the VA, they will have the right to go see a private doctor. We'll pay for the doctor. And frankly, we'll save a lot of money. We'll help a lot of vets. Everybody said they've been trying to get it for 45 years, everybody said you can't get it. Think of it. Think of it. Veterans Choice, they have to stand – our great people. These are our great people. Who's a veteran in this audience? Do you like Trump? Do you like the job we're doing? Now, think of it, 45 years, everybody said you'll never get it passed. And I used to say before I really was well-versed on the veteran situation in health care, I used to say all the time, "Why don't they just let the folks go to a doctor?" They'd wait in line for 7 days, 9 days, 14 days, 21 days. Some of them started off with a very modest problem. They end up being terminal because they can't see a doctor. I said, "Why don't they just let them go see a local private doctor, pay the bill and take care of it?" It will be a lot less expensive. And it's turned out to be something that the veterans love. And it's passed. It's passed. They've been trying to get it passed for 38 years. The other one is 45, and that's VA accountability. If somebody treated our veterans badly, if they stole, if they was – if they were – you know this, if they were sadistic, if they were really bad to our vets, all right? Really, really bad, we couldn't do anything about it. They could steal. They could rob. They could be abusive. You couldn't say, "You're fired." Now you can say, "You're fired." Made a big difference. That was another one they said you'll never get it done between civil service and unions. We love them both. But between civil service and unions they said, "You'll never get it done. You'll never get it approved." And by the way, we had virtually no help, very little from Democrats. Very little. Not because it's not right, but because they don't want to give Trump any victory. They'll do everything that's wrong. Look at Judge Kavanaugh. This is a great, great highly respected man. And the good news is the Republicans, I believe, are close to a hundred percent, which is what we need. But so far, the Democrats haven't given us any votes, and that's because they will do anything they can to not help the Trump agenda, even though they know it's wrong. And Brett Kavanaugh, highest education, best grades, best tests, best everything. They thought 15 years ago he was going to be a Supreme Court judge. Look at Justice Gorsuch, how good is he? How good is he? So we're getting them through. But it's not easy because they really are. You know, their term that they use is, "resist." It's actually resist and obstruct. Whatever they can do to resist and obstruct. And frankly, they're lousy politicians. They have horrible policy. The one thing they're good at, they stick together and they obstruct. And it's unfortunate. You know, we have almost 400 people trying to get into government, many of whom have left their jobs and the Democrats are holding them up with maximum delay. They're holding them up, not allowing these great people to serve their country. It's a disgrace. That's Chuck Schumer, and it's a disgrace. It's a disgrace. But we'll get that Supreme Court judge, and that's the big one. That's the big one. Really important for those who love our military, we have secured a record $700 billion for our military with another $716 billion next year all approved. And this is great news for the incredible patriots at MacDill Air Force Base, the proud home of the Sixth Air Mobility Wing U.S. Central Command and Special Operations Command. Come on! We're adding nearly 30,000 new soldiers, sailors, airmen, Marines and we have secured the largest pay raise for our great warriors in a decade. I've also directed the Pentagon to begin the process of creating the sixth branch of our military, the space force – building the space force. And we're doing well in North Korea, although I happen to think that we're doing so well with China that China maybe is getting in our way. But we're going to figure that one out before you can even think about it. But we're doing well in North Korea. We have our – as you know, we have our hostages back. There's been no nuclear testing. There's been no missiles or rockets flying beautifully over Japan. I think our relationship is very good with Chairman Kim, and we'll all see how it all works out. But there's nothing like talking, and we'll see how it is. You remember when I first took office? It really looked like big trouble. In the past administration, they thought that was by far their biggest problem. So I think it's going to work out very well. But a lot of good things are happening. No tests. No rockets flying. But we'll see what happens. And our Vice President, Mike Pence, is going to Hawaii to bring back the remains and to greet the families of our great heroes who gave their lives in Korea. Our fallen warriors are finally coming home to lay at rest in American soil. I also withdrew the United States from the horrible one-sided, $150 billion was paid — $1.8 billion in cash. The Iran nuclear deal, it's a horror show. I hope it works out well with Iran, they're having a lot of difficulty right now. I hope it works out well. And I have a feeling they'll be talking to us pretty soon. And maybe not and that's okay too. In December, I recognized Israel's true capital, Jerusalem. And in about five months we opened already the American embassy in Jerusalem. And people had that scheduled for anywhere from five to ten years and you all know the story. We took an existing building. We played around with it. We renovated it. We fixed it up. We use Jerusalem stone, one of the finest stones actually in the world, Jerusalem stone. So, instead of spending 1 billion and the papers were right in front of me – sir, would you please approve this? What is it? This is for the embassy in Israel, American, sir. I said, "How much?" "$1 billion, Sir. 1 billion!" I immediately called our great ambassador to Israel, David Friedman — very successful man, great lawyer, one of the most successful lawyers in the country before he decided to do what he's doing. I said, "David, they want us to pay a billion dollars for the embassy. I don't want to pay a billion dollars." I said, "Study it – do you have any buildings that we own?" We own so much we don't even know what the hell we own. "Find some building in a great location. Call me back." Called me back two days later. He said, "Mr. President, Sir, we own the best site in Jerusalem. It's big. It's beautiful and it's got a building on it. I can take that building and renovate it. I can do it for $140,000." I said, "David, how good is the site?" "We could never buy a better site." They were willing to spend tens of millions for a site. They wanted to buy a site which was so bad. It was totally inferior to what we already had. Don't forget, we get there first, right? You know, we have good sites. And I said, "David, do me a favor, don't make it $140,000. Sounds too cheap. Make it like 400,000. That's okay too, David." So we saved almost a billion dollars. I could tell you these stories all day long, airplane purchases. I could tell you all day long. And we started working – and for $400,000, we actually have a very beautiful American Embassy in Jerusalem — really beautiful. Now, that's one I guarantee no other president is doing. Can you imagine crooked Hillary doing that? Can you, honestly? Can you imagine? In all fairness — in all fairness to her, could you imagine anybody else doing that? Nobody else. Nobody else is going to do that. And I could tell you stories about what we've saved with purchases of military equipment, General Mattis would be glad to tell you — but he can't believe it. And some of the generals have said they've never seen anything like it in the world — they've never seen. Because I want that $700 billion properly spent. If we can buy twice the number of aircraft or have a lot of money left over that's what we want. Instead of apologizing for America we're standing up for America. We're standing up for the heroes who protect America and, yes, we are proudly standing up for our great national anthem. With every promise we keep, every record we break, every factory we open, we are restoring American strength and American pride. But to continue this incredible moment of this incredible movement — and that's what we have, we have a movement. This may be, in fact it probably is, the greatest movement in the history of our country. Even they will say that. Even they will say that. But to keep it going we need to elect more Republicans. We need more votes. And we need to elect Ron DeSantis as your governor. Got to do it. And I'm telling you, I know him well, he's a great, great guy. He is going to be an incredible governor, I have no doubt — I have no doubt. I don't do these endorsements easily. I don't need to be here but I happen to love this state so it (inaudible). And I don't do them easily. Although, it seems to have an impact. The other day we endorsed a great gentleman from Georgia. He was probably five points down. He won the election by 40 points. He got 70 percent of the vote — the 30 (ph), think of that. Great guy. And many others. I mean, we could go over one after another, after — they're actually starting to give us credit for this. I don't think there's ever been anything like it. That's why I had to be here to formally — you know, I've been endorsing Ron, I've been saying great things but I wanted to be here to formally endorse Ron, you got to get out and vote. Thank you, Ms. DeSantis (ph), thank you. Thank you. Beautiful family. Get your friends, get your colleagues, get your neighbors and get out and vote in November. You've got to do it because, remember, we're going to win this primary but don't take any chances. Nice lead — nice lead. Don't take any chances. And then about, give yourself about 10,15 minutes of happiness and then go back to work for November. Because we have to remember they're putting up — I know some of the candidates, these are people that don't care about stopping crime. These are people that don't care about people pouring into our country when they shouldn't be here. They don't care about stopping drugs from poisoning our youth and pouring over the border, they don't care. Your future governor cares. And your current governor cares, Rick Scott. Loyal citizens like you, incredible people from the great state of Florida helped build this country. And, together, we are taking back our country. We are returning power to where it belongs, the American people. This state was settled by pioneers and visionaries who explored the marshes and raised up cities right on the sea. This state was built by red-blooded American patriots who opened the force Naval Air Station at Pensacola and launched the first brave Americans soaring into the heavens. We stand on the shoulders of generations of proud Americans who knew how to work, knew how to fight, and knew how to win. Win. And you know, when you elect Ron DeSantis as your governor — because you see it already, we're winning so much. Some people are getting a little tired of winning, right? Well, by then it will be another year and two years and three years and you'll be insisting, Governor DeSantis, please see our president, it's too much winning. We can't — we can't stand it. The people of Florida, we can't stand it. Because under previous administrations we never won. We got used to never winning. And he's going to come to me, in Washington, in the Oval office — the beautiful Oval Office — and he's going to say, Mr. President, the people of Florida are just down-right tired of winning, they can't stand it. It's just too much, Mr. President. The economy is too good. The jobs are too strong. We're doing too well, is there anything you can do? I'm going to say, "Ron, I don't care what you say, we're going to keep on winning." We're going to keep on winning. We're going to win so much and the people of Florida actually love, don't they? They love it. Remember what I said right at the beginning, we're respected again. And that man is respected and always has been. We will never give up. We will never give in. We will never, ever back down and we will never, ever surrender. Because we are Americans and our hearts bleed red, white, and blue. We are one people. We are one family. And we are one glorious nation under god. And together we will make America wealthy again. We will make America strong again. We will make America safe again. And we will make America great again! Thank you Florida! Thank you.